Creative Assembly have detailed a little bit of what to expect from the story in Total War: Thrones of Britannia in a new video featuring game director Jack Lusted – who is, incidentally, sporting a positively incredible red suit and ascot. Just putting that out there. Here are all the best strategy games on PC. In contrast to the event chains in previous games that had a linear path, Thrones of Britannia will feature choices to be made along the way, to prevent you from seeing the same story in each campaign. Different choices lead to different outcomes in each event, and the AI will be faced with those same decisions, ensuring there’s variety in your campaigns. 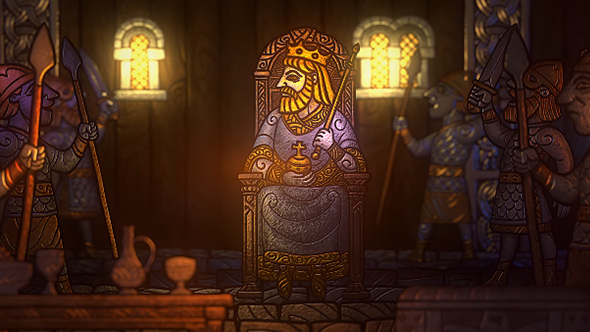 Events come with 2D cutscenes based on era-appropriate church carvings and metalwork, with each faction having their own intro movies along with unique victory videos. And, of course, this isn’t Warhammer – you don’t have immortal legendary lords. Instead, your rulers can die at any time, hence why events and story are built around factions rather than lords. Thrones of Britannia is due out later this year. The developers have already detailed the full roster of units that will be available to the Anglo-Saxon factions.